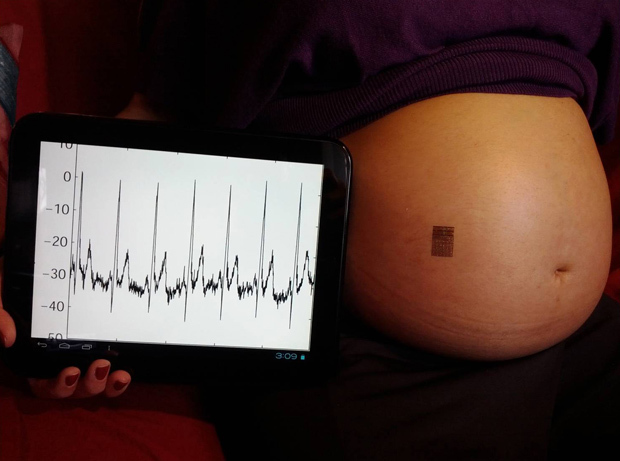 A tiny tattoo-like electronic device could someday provide wireless pregnancy monitoring of maternal and fetal vital signs, giving expectant mothers more mobility and improving access to prenatal care in remote areas. Noting that mobile phone usage is often high even in areas with limited health care, Professor Todd Coleman said the device could transmit bodily signals to a mobile phone, securely connecting the patient to a doctor thousands of miles away. Photo courtesy of Bioengineering Professor Todd Coleman, UC San Diego Jacobs Shool of Engineering. Grand Challenges Explorations (GCE) funds individuals worldwide to explore ideas that can break the mold in how we solve persistent global health and development challenges. Coleman’s project is one of over 100 Grand Challenges Explorations Round 8 grants announced today by the Bill & Melinda Gates Foundation. To receive funding, Coleman and Rogers along with other Grand Challenges Explorations Round 8 winners demonstrated in a two-page online application a bold idea in one of five critical global heath and development topic areas that included agriculture development, immunization and nutrition. Applications for the current open round, Grand Challenges Explorations Round 9, will be accepted through May 15, 2012. Coleman’s project will advance the epidemiology of pre-term birth by using flexible tattoo-like devices to continuously monitor uterine contractions, fetal heart rate and oxygen, and maternal heart rate and body temperature. In addition, their technology has the potential to enable non-invasive, wireless and continuous pregnancy monitoring of at-risk patients. The project uses a skin-mounted electronics system developed in collaboration with Rogers at the University of Illinois. 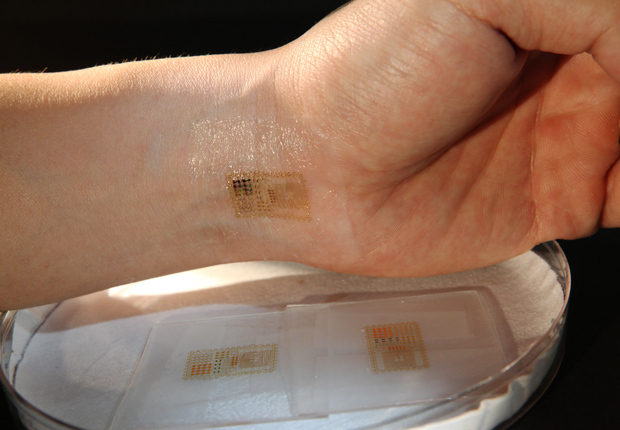 The wearable patch of tiny circuits, sensors, and wireless transmitters sticks to the skin like a temporary tattoo, stretching and flexing with the skin while maintaining high performance. This approach builds upon a class of flexible electronics technologies that Rogers has pioneered. “These systems provide fundamentally new and powerful ways to integrate electronics with the skin, in a manner that blurs the distinction between the two. The ideas are sufficiently simple that they open up new, exciting opportunities to address, cost effectively, important problems in global health,” said Rogers. In the first phase of the project, Coleman and Rogers will partner with Dr. Gladys Ramos and her colleagues from the Department of Reproductive Medicine, UC San Diego Health System, to monitor patients in labor and determine how well the device’s sensors perform compared to standard clinical technology. The wearable patch of tiny circuits, sensors, and wireless transmitters sticks to the skin like a temporary tattoo, stretching and flexing with the skin while maintaining high performance. Photo Courtesy of Materials Science and Engineering Professor John A. Rogers at the University of Illinois at Urbana-Champaign. “Our goal is that we will accurately be able to detect the signs and symptoms of preterm labor in a reliable and non-invasive manner,” said Ramos. Coleman’s lab at the UC San Diego Jacobs School of Engineering is extending the robustness and capabilities of these devices to match relevant clinical applications, while maintaining accuracy and sensitivity. For example, Coleman is using his expertise in signal processing and neuroscience to design novel sensors and wireless radios that can effectively acquire, process, and transmit bodily signals during natural skin deformations. “We see this as a compelling opportunity to move these prototypes from the bench top to the bedside, where our capabilities uniquely match an unmet need,” said Coleman. “First, the form factor and accuracy of our device will uniquely be able to monitor the pregnant mother in a multi-modal, continuous, and most importantly, unobtrusive manner. Secondly, there is tremendous potential for developing countries, where healthcare access is limited but mobile phone usage is high. Our goal is for the electronic tattoo to transmit bodily signals to the mobile phone, which then uploads to the cloud, so that a doctor thousands of miles away can securely access the information and provide clinically actionable advice. We envision the phrase, ‘Take two of these and call me in the morning,’ being replaced with, ‘Wear this tattoo and I’ll call you when there’s a problem,’” said Coleman. MC10, the leader in commercializing thin, conformal, epidermal electronics systems, will work closely with Coleman, Rogers, and their partners to speedily develop, test, and deploy this revolutionary approach to advancing the quality of pregnancy monitoring in underserved populations. Grand Challenges Explorations is a US$100 million initiative funded by the Bill & Melinda Gates Foundation. Launched in 2008, over 600 people in 45 countries have received Grand Challenges Explorations grants. The grant program is open to anyone from any discipline and from any organization. The initiative uses an agile, accelerated grant-making process with short two-page online applications and no preliminary data required. Initial grants of US$100,000 are awarded two times a year. Successful projects have the opportunity to receive a follow-on grant of up to US$1 million.